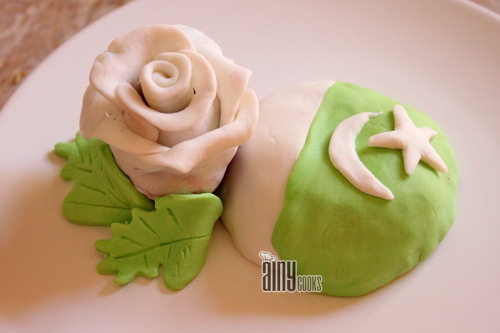 Pakistan Day we celebrate to remember the Lahore Resolution on March 23 each year. The word “Pakistan” was never used but the Lahore Resolution is considered a major milestone in the Muslim struggle for an independent state in undivided India. fail recipe of Custard cup cakes/ dome cake. I have made small dome cakes but you can make cupcakes or a normal cake from the same recipe. Pre heat oven at 150 c and grease your baking pan. In a bowl cream together butter and sugar. Now add custard powder, flour and baking powder (sieved) in egg mixture. Pour in cake or muffin pan and bake at 180c till done. 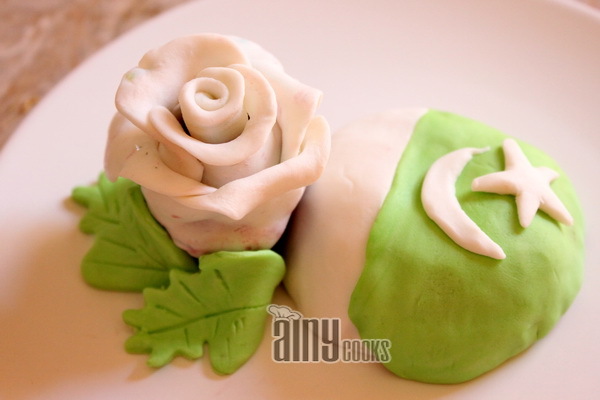 Let them cool completely and spread butter cream on top and roll fondant to make flag and spread on each cupcake. You can serve as it is or top them with any topping of your choice. I have served my dome cake with a ROSE. In my next post i will explain you the method of making rose. Make custard of any flavor and top these cupcakes or cakes with it ,if you want to serve with this topping.But spread custard on cupcakes just before serving otherwise they will become soggy.